It seems about time for Betty Boop to make another appearance, and this time she stars as the title character of a little singalong featuring Rudy Vallee. Like many a true artist, Betty was willing to make sacrifices for her art, and she put on a few pounds for this role. From the Internet Archive, here is the 1931 Max Fleischer cartoon, Kitty From Kansas City. 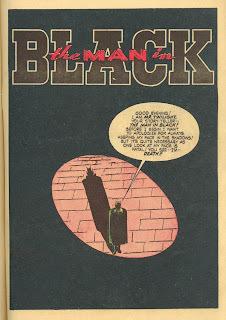 Pappy's Golden Age Comics Blogzine posted this pair of stories about fighting robots. In the first, the hero is Robotman, a robot who poses masquerades as a human, and uses his mechanical powers to fight evil. 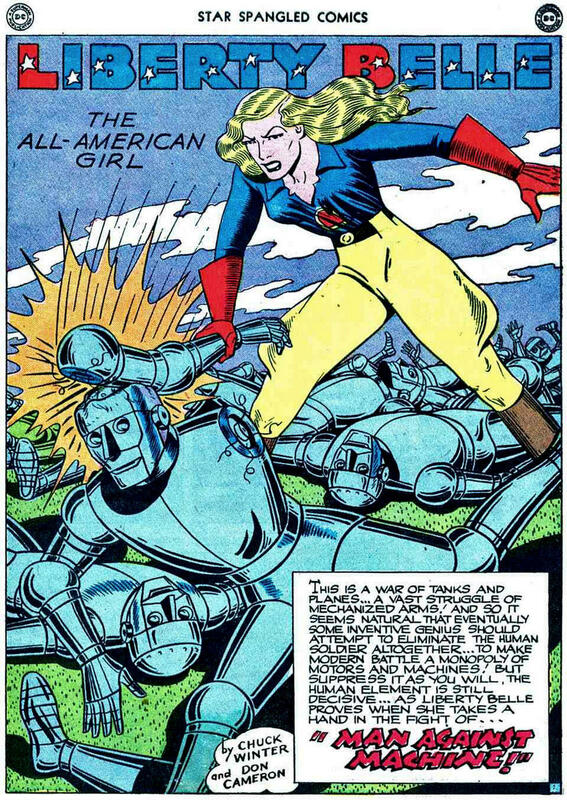 In the second story, All-American Girl Liberty Bell opposes a scientists plan to have robots fight for the U.S. rather than soldiers. When the robots go haywire, she makes her point. Today's Sunrise Serenade was "Flat Foot Floogie" by the Mills Brothers with Louis Armstrong. Enjoy the video from YouTube. The playlist for the May 27, 2015 broadcast of the Swing Shift Shuffle has now been added to the playlist filing cabinet. The Hemmings blog noted that the Auburn Cord Duesenberg Museum in Auburn, Indiana currently has John Dillinger's 1933 Essex Terraplane on display. I have visited the ACD Museum several times, and it is one of my all time favorite museums. Housed in the gorgeous Art Deco headquarters and showroom of the original Auburn Automobile Company, the ACD is a wonderful exhibition of not only those iconic marques, but also many other vintage automobiles, with one area set aside for cars made in Indiana. Dillinger's Essex Terraplane was a high performance vehicle for its time, powered by a Hudson straight eight. This morning's Sunrise Serenade was "Barrelhouse Bessie From Basin Street" by Bob Crosby and His Orchestra. Click on the song title to listen courtesy of Jazz On Line. Today's Sunrise Serenade was "Smoke Gets In Your Eyes" by Artie Shaw. Click on the song title to listen courtesy of Jazz On Line. Today's Sunrise Serenade was "Them There Eyes" by Anita O'Day. Enjoy the video from YouTube. The playlist for the May 20, 2015 broadcast of the Swing Shift Shuffle has now been added to the playlist filing cabinet. 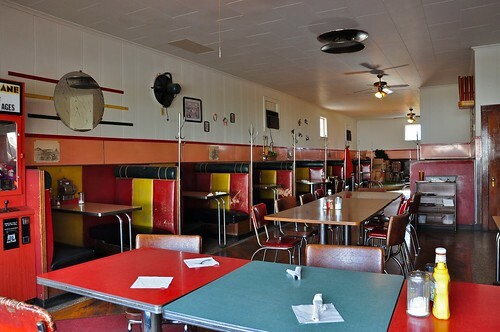 If you are in the mood for a little time traveling in Berwick, Pennsylvania, Retro Roadmap suggests you stop by The White Horse grill, a 1940 diner still sporting all of its original charm and furnishings, including original 1940's table-top juke boxes. This morning's Sunrise Serenade was "Skies Are Blue" by Andy Kirk and his Clouds of Joy. Click on the song title to listen courtesy of Jazz On Line. Today's Sunrise Serenade was "Java Jive" by the Ink Spots. Click on the song title to listen courtesy of Jazz On Line. This morning's Sunrise Serenade was "Are You Ready?" by Lucky Millinder and His Orchestra. Click on the song title to listen courtesy of Jazz On Line. Bugs Bunny returns in this encore from 2012 that plays on the title of a popular movie from the Swing Era, Stage Door Canteen. From the Internet Archive, here is the 1944 animated short, Stage Door Cartoon. 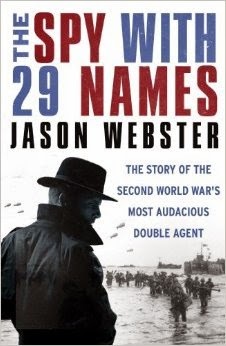 The Best of World War II blog posted this item about The Spy with 29 Names, a book by Jason Webster. The spy is question is none other than the legendary double-agent "Garbo." Garbo was in reality, Juan Pujol, a Spaniard who was caught up in the Spanish Civil War. After being rejected initially by British intelligence, he started feeding the Germans false information on his own. When the British discovered how effective he was at misleading the Nazis, they quickly changed their minds. The Germans were so trusting of Garbo's information, that their reliance on it effectively cemented the success of D-Day. The Germans even awarded him the Iron Cross, making him probably the only person in history to receive that honor and the Victoria Cross from Great Britain. The playlist for the May 13, 2015 broadcast of the Swing Shift Shuffle has now been added to the playlist filing cabinet. 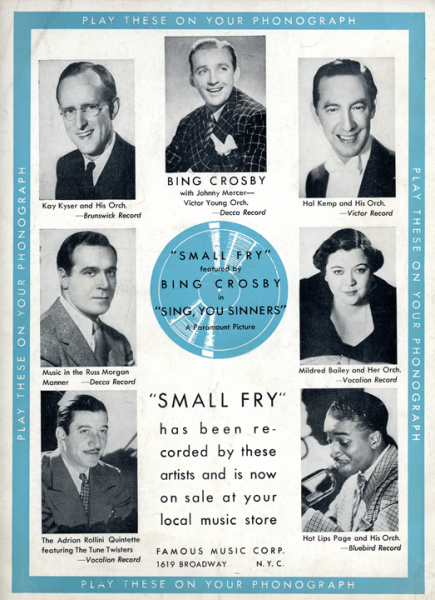 I took to collecting Swing Era sheet music a few years back, so I found this post on Vintage Ads particularly interesting. 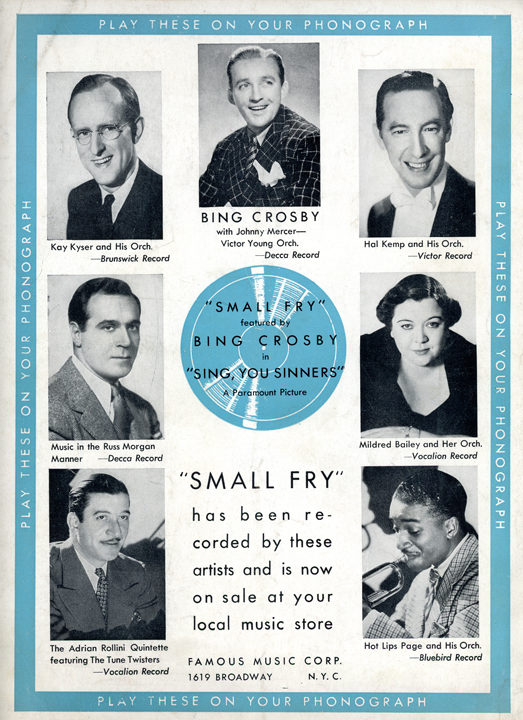 It features several advertisements for sheet music, as well as the ad above, which appears to be promoting recordings of "Small Fry" by seven different artists, including Bing Crosby (the original), Kay Kyser, Hal Kemp and Mildred Bailey. Today's Sunrise Serenade was "Mister Meadowlark" by Bing Crosby and Johnny Mercer. Click on the song title to listen courtesy of Jazz On Line. This Man in Black is neither Johnny Cash nor Tommy Lee Jones. According to Four Color Shadows, in later reprints of this comic, the "Man in Black" was Fate. In this version, he refers to himself both Mr. Twilight and Death. Also staring in this story are Old Man Time and a gremlin. This morning's Sunrise Serenade was "Frankie And Johnny" by Guy Lombardo and His Royal Canadians. Click on the song title to listen courtesy of Jazz On Line. In honor of Mothers Day, we present an encore of an early Ray Harryhausen animated short featuring Mother Goose. From the Internet Archive, here is the 1946 stop-motion animated film, Mother Goose Stories. It just dawned on me that today is the 70th anniversary of V-E day, which makes this particular serenade somewhat appropriate. These provided over a third of the vegetables consumed in the United States! By 1943, 18 million victory gardens were flourishing – 12 million in cities and 6 million on farms. Wherever there was space (roofs, window boxes, backyards), a garden became a great way to save money and put food on the table. 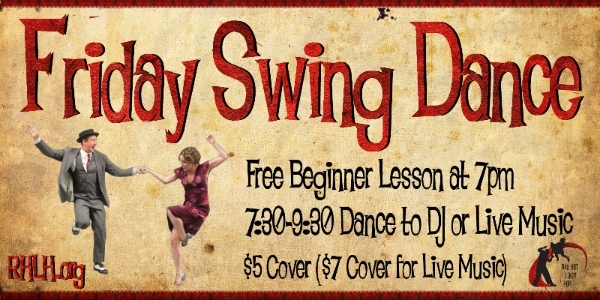 The playlist for the May 6, 2015 broadcast of the Swing Shift Shuffle has now been added to the playlist filing cabinet. The Orpheum Theatre has announced its Summer Movie Series schedule. While I recognize that times and tastes change, I cannot help but miss the old "Summer Classic Movie" series, which as its name implied, featured more movies from the Golden Age of Hollywood. Nevertheless, there are a few classic gems on this season's schedule, including Casablanca, The Wizard of Oz, Gone With The Wind, and (although outside the Swing Era, still a classic) The Sound of Music. This morning's Sunrise Serenade was "You Won't Be Satisfied (Until You Break My Heart)" by Les Brown and His Orchestra with Doris Day on vocals. Click on the song title to listen courtesy of Jazz On Line. World War II "Ghost Army"
Boing Boing posted this trailer about the newly released book, The Ghost Army of World War II. The Ghost Army was a U.S. military unit whose sole purpose was to use deception to convince the Germans that this small unit of troops was an entire army. The work of this unit, combined with British intelligence and other operations, convinced Hitler that the D-Day invasions of Normandy were a diversion, and that the real invasion would come at the Pas de Calais.